VATICAN CITY (Reuters) - A year after his shock resignation, Pope Emeritus Benedict has no regrets and believes history will vindicate his tumultuous and much-criticized papacy, the man closest to him told Reuters in a rare interview. Archbishop Georg Ganswein, who now works for the former pope as well as being the head of Pope Francis's household, shed new light on how Benedict spends his days, his health, his feelings about his momentous decision and the relationship between the two popes. 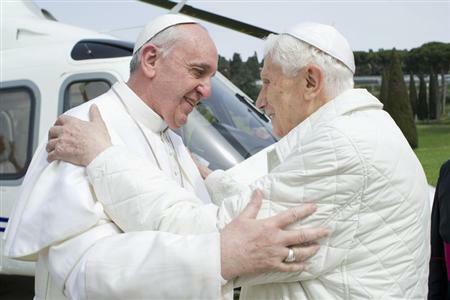 "Pope Benedict is at peace with himself and I think he is even at peace with the Lord," said Ganswein, whose twin roles bring him into contact with the current and former pope daily. Benedict announced his decision to resign, the first pope to do so in 600 years, on February 11, 2013, citing the physical and psychological strains of the papacy. He stepped down on February 28 and Francis was elected on March 13 as the first non-European pope in 1,300 years. His eight-year papacy was marked by mishaps and missteps, often blamed on a dysfunctional Vatican bureaucracy, and intrigue befitting a Renaissance court. The "Vatileaks" scandal, in which Benedict's butler was arrested for leaking the pope's private papers to the media, alleged corruption in the Holy See, something the Vatican denied. A rigorous theologian-teacher and reluctant chief executive, he was often vilified by some in the media for a style seen as distant and aloof. Ganswein, who has been at Benedict's side since before his election in 2005, said the former pope had no regrets about leaving office and held no resentment against his critics who the Vatican says misunderstood him. "No. It's clear that humanly speaking, many times, it is painful to see that what is written about someone does not correspond concretely to what was done. But the measure of one's work, of one's way of doing things, is not what the mass media write but what is just before God and before conscience." "I am certain, indeed convinced, that history will offer a judgment that will be different than what one often read in the last years of his pontificate," Ganswein said in a telephone interview. 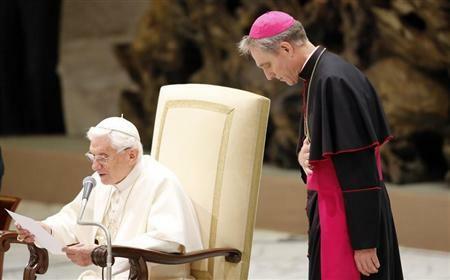 Benedict, who now resides in a former convent in the Vatican gardens, said before he left office that he would live out his days "hidden from the world" in prayer and isolation. He has been photographed only four times since then. "Indeed, he is far from the world but he is present in the Church. His mission now, as he once said, is to help the Church and his successor, Pope Francis, through prayer. This is his first and most important task," Ganswein said. Benedict was cheered by conservatives, who have not taken to Francis' more open, informal style, for trying to reaffirm traditional Catholic identity, while liberals accused Benedict of turning back the clock on reforms and hurting dialogue with Muslims, Jews and other Christians. When Benedict decided to stay in the Vatican, there was much speculation that the decision could have a destabilizing effect on the Church but the fears did not materialize. "From the very start there was good contact between them and this good beginning developed and matured. They write to each other, they telephone each other, they talk to each other, they extend invitations to each other," Ganswein said. He said Benedict spends his time studying, reading, handling correspondence, receiving visitors, playing the piano and praying while taking walks in the Vatican gardens. "He is well but certainly he is a person who carries the weight of his years. So, he is a man who is physically old but his spirit is very vivacious and very clear," Ganswein said.